Hula Hooping Mom: Sour Jacks - New Flavors!! Sour Jacks - New Flavors!! I love to bake and explore with lots of different treats, especially this time of year, when the holidays are upon us. What kind of goodies do you have around for Halloween? My son's favorite candy is anything sour! Not my cup of tea, but def his! Those sour faces they make - priceless! Needless to say he was excited to hear that Sour Jacks now has four new flavors out - Wildberry, Green Apple, Watermelon and Lemonade and just in time for Halloween! 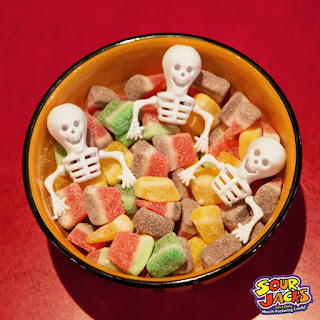 If you like to cook and be creative like I do, below are some fun examples of different ways you can use Sour Jacks within your Halloween goodies!! Love the witches - too cute! Follow Sour Jacks on Facebook for more fun ideas! !